This Week, Leon Bridges Added Another Jool To His Crown. And this week, his Fort Worth brother-in-arms Leon Bridges conquered one of the three when he performed “Better Man” on Later…with Jools Holland earlier this week. It marks his second late-night television performance of the year — and this before his debut album has even been released. 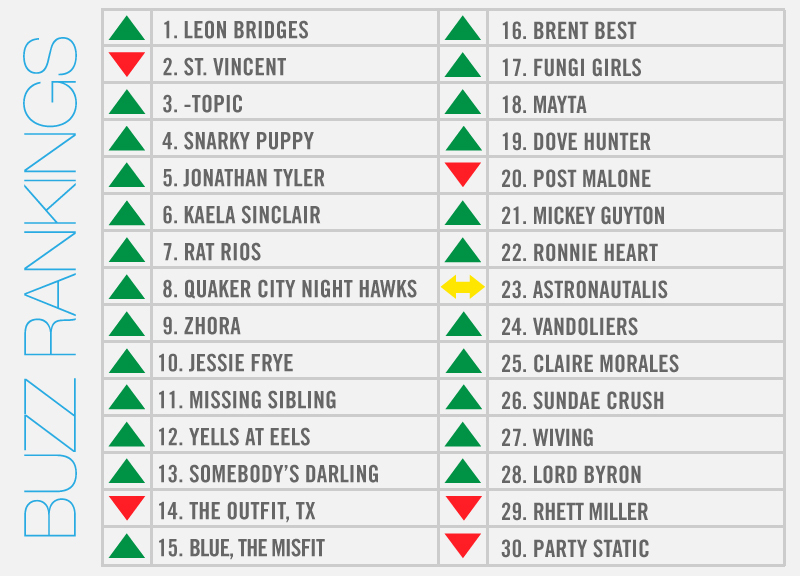 It's no shock, then, that Mr. Bridges finds himself atop our weekly, local music power rankings for the seventh time now. He's on something of an unprecedented streak, too, having hit No. 1 at least once every month of 2015 so far. It's one we imagine will only continue once his album finally does drop this summer, especially seeing how taken even strangers on the street are with his tunes. Just behind Bridges was five-time Buzz champ and last week's No. 1, St. Vincent, whose performance with the DMA this past Sunday will no doubt be remembered as the cornerstone event in this year's inaugural SOLUNA festival. In the No. 3 hole this week is -topic, who will hold a two-day birthday celebration this weekend at Three Links, which earned him a feature in the Dallas Observer. Other artists profiled in Dallas media this week were Rat Rios, Yells at Eels, Lord Byron and Mickey Guyton. Then there was Jonathan Tyler, Jessie Frye and Somebody's Darling, who all performed at that first-year DMD Fest that was poorly attended by just about everyone but the press. Elsewhere, other acts earned their ranks with new audio and/or video releases. 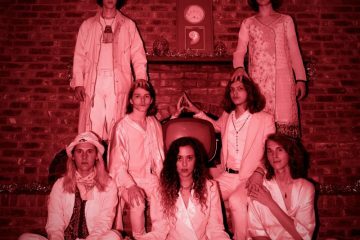 Those include: Kaela Sinclair, whose “Original Sin” video we premiered this week; Snarky Puppy, whose major label debut became available to stream a week ahead of its official release; and Fungi Girls, which heads out on tour following a couple release shows this weekend.